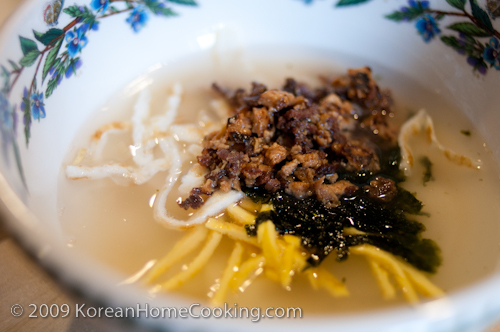 As I explained in the previous post, tteok-guk is also known as a new year's soup or an age-soup. This is because when we were young, we were told by our parents that we get older as many bowls of tteok-guk as we eat on the new year's day. Of course, the kids even back then were not that naive to believe such things, but it was certainly a playful thing to talk about as the family were having this soup altogether on new year's day. In Korean culture, we count our age from the new year's day, instead of from our birthday as in western culture. So, this notion of tteok-guk as an age soup must come from the tradition that the elderly asking young childeren how old they have become on the new year's day. By the way, this doesn't mean that you cannot have tteok-guk on other days. 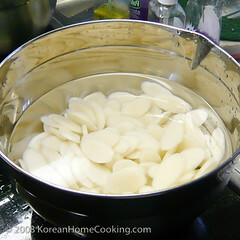 Soak the rice cake in water for 30 minutes, if using the air-tight packaged rice cake. 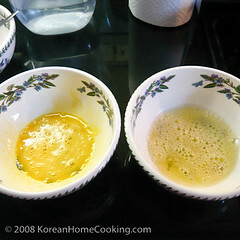 Separate an egg white and yolk. 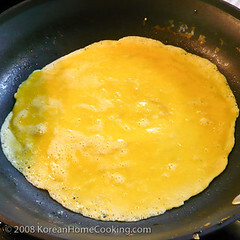 Pan fry egg white and yolk separately into a thin layer. 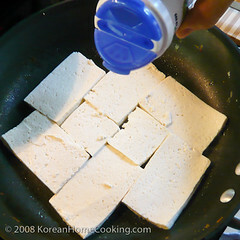 Slice tofu into about 1/4" thick layer and pan fry with a dash of salt over the top. When they turn golden brown, cut into little cubes. Set aside. 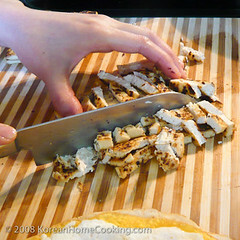 Chop the meat when it's slightly frozen. 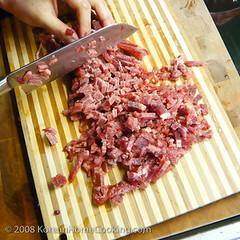 It is recommended that you chop the meat using a knife instead of using a blender or buying ground beef to preserve the chewing flavor of beef. 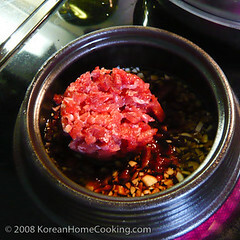 Over low to medium heat, boil in Korean soy sauce minced garlic and chopped beef for 15+ minutes. 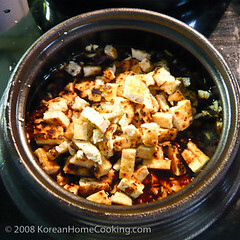 Add the tofu cubes from Step 6 to the Korean soy sauce+beef mix, and boil over low to medium heat for 5 to 10 minutes. 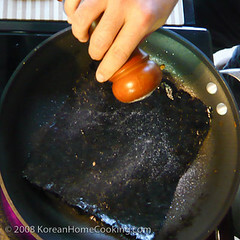 Spray the dry seaweed with little bit of oil and salt and toast quickly over medium heat. 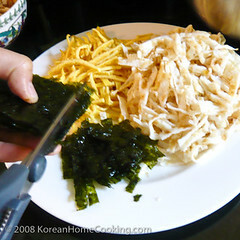 Or buy the pre oil+salted dry seaweed. 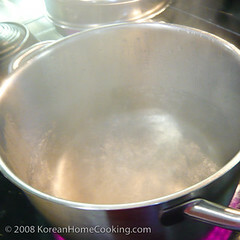 Bring the water to boil. 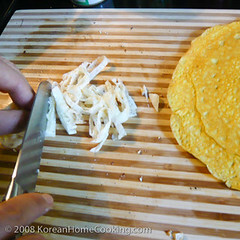 Add the rice cake from Step 1. When the rice cake afloat on the surface, it's done. I love this soup, but your recipe sounds better than any I've had. I'll have to try it soon! Thanks for your recipe, bought a bag of rice cakes the other day for stir fry but only needed half of it, now I know what to do with the leftover. I haven't tried stir-frying these rice cakes before. I have some left-overs and I must try. :) I hope you enjoy the soup, Mittens. I love rice cakes in all forms, so I definitely love this dish. Looks great!